Whether utilized for a security guard, ticket booth or money collector your employee will appreciate the comfort they will receive during their call of duty. Often, guards are forced to sit outside their guard sheds due to discomfort from heat or need for better air circulation. 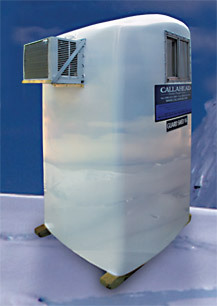 Adding the CALLAHEAD AIR CONDITIONER to your unit will eliminate guards or ticket booth attendants from sitting outside complaining, which encourages a poor reflection of the employer. In addition, the AIR CONDITIONER will assist employers in retaining better and happier employees, which means improved job site operation and accomplished workers. This 5,000 BTU system is equipped with thermostat, energy saver and fan modes, so the user can adjust it to their ideal comfort level. Adjustable louvers also allow the user to direct the air flow towards or away from them. 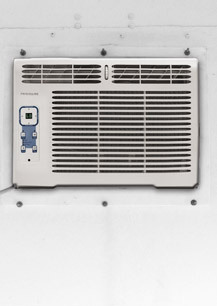 The AIR CONDITIONER is easily operated with push button or dial operation depending on the model installed. CALLAHEAD installs the AIR CONDITIONER directly into your Guard Shed, Portashed or PORTAHEAD and maintains the unit, so you don’t have to. Understanding the needs of our customers so they may worry less and produce more efficient job sites is what sets CALLAHEAD apart from the rest. CALLAHEAD is always upgrading our equipment and systems so air conditioner models may vary.